The author of this review for the Cameron .09 marine engine heaps praise upon the creation, extolling it many advanced features. Robust construction and smooth running evidently are two of its grandest characteristics. 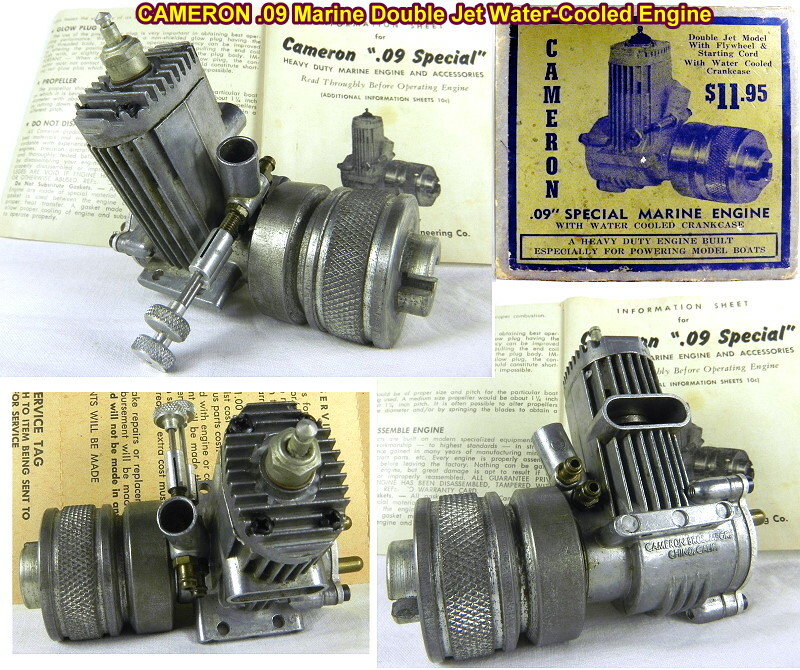 A few examples of the Cameron .09 marine engine appear on eBay, with a montage of photos of a new-in-box (NIB) example provided here. Weight including the built-in flywheel is 10 ounces - quite beefy compared to a Cox Medallion .09, which tipped the scales at around 3½ ounces. The Cameron .09 Marine Engine is perhaps the first inboard internal combustion model engine developed especially for powering model boats. The Cameron is easily recognized from all other engines by its vertical cooling fins. These are properly proportioned for extra rigidity, freedom from stress and efficient thermal regulation. It is undoubtedly the heaviest and most rugged .09 engine ever produced in this country. 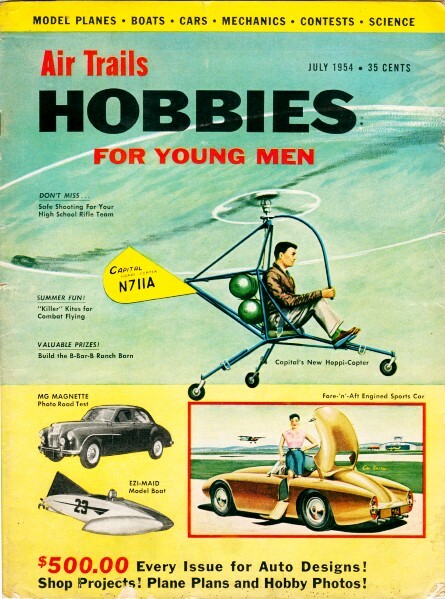 The weight including fly wheel is approximately 10 ounces. Its extreme running smoothness is attained by an exceptionally heavy crankshaft counter-balance and a special recessed friction-drive fly wheel that mounts in such a manner that it extends rearward as well as forward, beyond the outer end of the main engine bearing. The main bearing is hardened steel, with approximately a 1/8 inch wall thickness. The governor porting provides for maximum power development, steady pulling characteristics, ease of obtaining proper needle valve settings and the elimination of all possibility of the engine running away with itself when not under load. Needle valve adjustments are absolutely not critical. 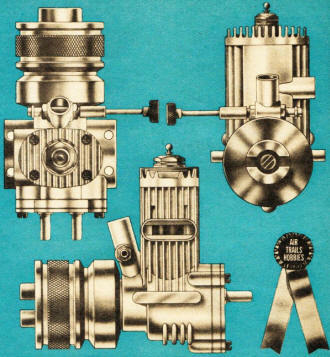 The engine starts very quickly whether hot or cold and may be primed either by priming directly into the exhaust port or by conventional choking methods, with equally good results. Ability not to over-rev itself when not under load was immediately apparent during the test. The Cameron .09 will power the largest kit boat now available. The main engine block is die-cast of aluminum with deep vertical fins and is fitted with a hardened steel main bearing. The back cover is also cast of aluminum. A special metallic gasket is used between the crankcase and the back cover to allow proper heat transfer. The water-cooling back cover plate is stamped from aluminum and fitted with brass inlet and outlet pipes. It is separated from the crankcase cover plate by a fibre washer. Thick-walled cylinder liner is machined from steel, hardened and microlapped. The finned cylinder head is die-cast of aluminum. It is fitted with a small gasket which allows metal to metal contact and transfers heat. Hardened steel crankshaft and counterbalance are machined in one smooth piece with the crankshaft end ground to a smooth finish. A round rotary shaft port is employed. Hardened and ground steel crankpin is made to form a spacer washer for the connecting rod. Connecting rod is of forged aluminum. The hardened and ground piston is of the straight baffle type and is relieved from a point midway at the wrist pin to the skirt. The steel wrist pin is fitted with brass pads to insure against cylinder scoring. The fly wheel is machined from steel and is both knurled and slotted. It is friction driven, fitting a taper on the forward end of the crank shaft. It is securely held in place by a single round head machine screw. Its forward end is slotted to receive a ball and pin universal, as supplied with the drive shaft accessory kit, available for an additional $2.50. The brass needle valve body is relieved on the fuel entering side of the orifice to provide for ease and consistency in obtaining desired needle valve settings. Proper needle valve settings are maintained by use of a friction type threaded needle valve thimble, eliminating the minor vibrations of the needle point at the jet opening. We feel that the engine will be capable of long life.